We have a very large information folder available in the house. The vacation house is situated 700m outside the village-centre of Rozebeke. 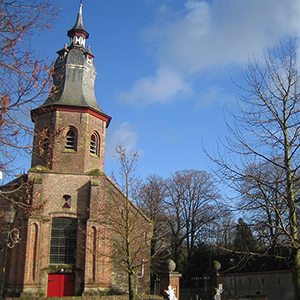 Rozebeke is an agricultural village known for its picturesque church (12th century) popularly called the “Cathedrale of the Zwalmstreek”. Every first Sunday after July 2nd, “Our Lady” is celebrated by means of a procession preceded by a religious service. This service starts with a blessing of roses. At the end of the service participants go, while praying and singing, 3 times around the church. The big statue of Our Lady that is carried along during the procession, was made in the 16th century. The blessed roses are carried by children in the procession and afterwards distributed amongst those present. The holiday is ideally situated as departure spot for many cycling trips through the beautiful landscape of the Flemish Ardennes. A lot of mapped out cycling trips are passing by the house and the starting points of the mountain bike routes of Brakel are very close by. Situated on the Rekelberg, nearby (< 4km) the hills the Molenberg, the Leberg, the Berendries and the Valkenbergstraat and nearby the cobble stone roads the Paddenstraat and the Haaghoek, you can cycle a mini Ronde Van Vlaanderen in less than an hour. The house has a separate cycle shed within the building. The Zwalm and an old asphalted railway track (the miner path) form the central axes around which the reserve stretches out. The territory is the living area of the extreme rare freshwater sculpin, the brown trout and the fire salamander. Forests with typical spring flora as bluebell, wild garlic, Lady’s Smock, True lover’s knot, Marsh Marigold and great horsetail are situated on the flanks of the valley. 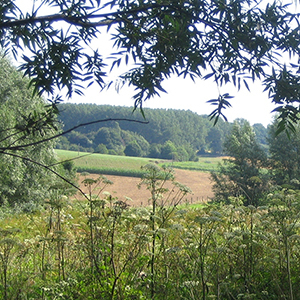 In the valley, which regularly flooded, you’ll find a mosaic of woodland, bush, meadows and swamps. An ideal biotope for salamanders, frogs and toads. The “Foxhole” is situated in a very varied landscape with big relief differences. The walk is guiding you along grassland, fields, bush, … through forest with old beech trees, hollow roads, … The varying surroundings is an ideal biotope for mammals as foxes, hedgehogs, squirrels, weasel and marten. This walk starts at the Saint Apollonia church from the neighbouring village and takes you along valleys, rural roads, rippling brooklets, beautiful views and the old “Perlinck” mill. More info on http://www.geutelingen.be/. PS: A “geuteling” is a regional culinary specialty, baked on stone in an oven which has a wood fire on both sides. You’ll find such an oven in the annex of the holiday house. -	In 15 minutes time, you’re in the centre of Oudenaarde or Ronse. Small, pleasant, historical towns with a lot of places to go out, pubs and restaurants for everybody’s purse. Take a nice walk along the many historical buildings, squares and the pretty, little roads. -	In 10 minutes time you’re in Brakel. A real walking borough! From the watch-tower in Elst, you have a fantastic panoramic view on the complete Flemish Ardennes. It’s also the ideal place to do all your shopping. -	In 5 minutes time you’re in Zwalm, also called the “12 village-paradise”. The picturesque villages of Roborst or Dikkele and the many, into restaurants converted water- and wind mills offer agreeable relaxation. -	In 5 minutes time you’re in the village of Velzeke. Velzeke is famous for its protected cobble stone roads the “Lippenhovestraat” and the “Paddestraat” (an old Roman road). Along the “Paddenstraat”, exactly on the spot where the Romans lived 2000 years ago, you’ll find the regional archaeological museum. This museum outlines by means of a multitude of objects, maps and documents the fascinating early history of Velzeke and South-East-Flanders. Take also a walk in the fresh air on the “Jan de Lichte” path. This path along the “Mill brooklet”, in which you can admire the stickleback from close by and where kingfishers, moorhens, grey herons and falcons have their home, offer great views. Tips for an agreeable company visit in the neighbourhood. www.hoorenskoffie.be: a coffee roasting house that offers “the finest coffee of the region”. www.kaashoeve.be: discover plenty of homemade cheeses, ice cream, fine meat products and fresh squeezed fruit juices. www.degraal.be: a small, artisanal brewery in Brakel. Discover the 6 own beers.